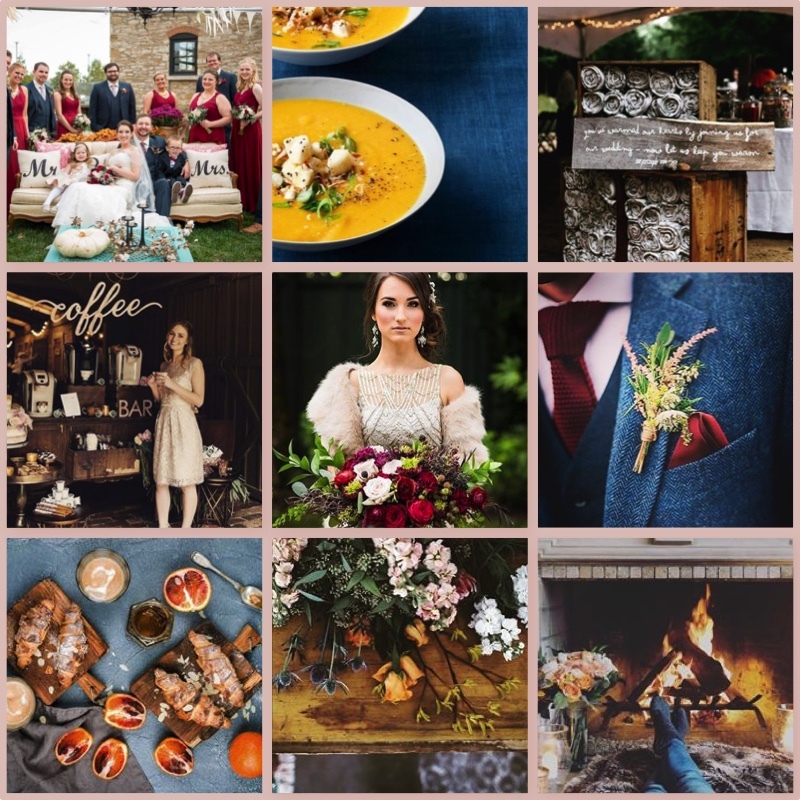 As the nights get cooler and the days get shorter, we just want to cozy up next to the fireplace and thing about how to warm up those winter-month weddings. It used to be that once October wrapped up, so did wedding season. Over the past 10 years or so, we've started seeing more and more weddings in the late Fall and Winter months and we love it! Not only do we get to take on and get to know more brides and grooms, but we get to be creative with winter color palettes, frosty florals and cozy fabrics. We've got 8 #ProTips on how to warm up those chilly weather weddings! #1 When choosing a color palette lean on the side of the warmer tones. We are reallying loving exposed wood looks, and the trio combination of rich burgundy, dusty blues and blush pinks. When it comes to the floral elements, be sure to choose in-season stems. Local florist Owens Flower Shop, is loving using the foliages, pods and berries that are available in the fall. We personally love dried blue thistles and the very on-trend pheasant feathers. All of these add so much texture and interest to floral designs! #2 We don't know how many times a bride has come to us worried that they're going to forget to eat on their wedding day. We promise: none of our brides have ever missed out on their wedding dinner. Whether you have a private dinner away from the party, or are seated at the middle at the head table, it's important to eat at your reception. But it's also important to make sure that you eat enough breakfast and lunch while getting ready and throughout your big day! We love an excuse to put together a stylish spread! Throw down a beautiful piece of fabric, a couple rustic cutting boards and cover them with fresh-baked pastries from the local bakery. Locally, we love picking up sweet treats from Munchers and Wheatfields Bakeries! Getting a variety, ensures that there's something for everyone. Have your MOH stop and get coffees for everyone and don't forget some yogurt and fresh fruit for all-day energy! #3 It's not all about the wedding dress anymore. We love that our grooms are not only becoming more and more involved in the wedding planning process, but they're also getting creative with their #suitandtie. A classic tuxedo will never go out of style, but why not have some fun with accessories? Today's grooms are doing just that. Socks, bowties, suspenders - patterned long ties and pocket squares. Men's bold fashion trends are finding their way to bridal looks and we are obsessed. Aside from the standard black, greys, tans, and burgundy suits are trending big, but we just love a navy suit in the fall and winter months. #4 If you're getting married in cooler temps, obviously you don't want to wreck your bridal look with your standard wool coat. Pick up a fur stole and up the glam factor while keeping warm! #6 Another solution to chilly outdoor ceremonies that we love is to provide your guests with a blanket or pashmina scarf to cuddle up with. The best part about this idea is that it can double as your wedding favor! #7 What better way to warm up during the winter months than with a beautiful bowl of soup? Consider adding a soup course to your reception menu on those chillier nights. During the winter months we love rich and creamy seasonal soups like this Roasted Butternut Squash recipe. The best part about this particular recipe is that it is perfect for preparation a day ahead of time - so your caterer won't hate you! #8 Dress your ceremony and reception spaces with comfy seating areas. We absolutely love creating living room areas within our event designs. Oversized and vintage furniture is warm and inviting, and allows your guests to have cozy conversations!